Love the look and feel of this piece! It is very solid and the top drawer is lined which I was not expecting! It shipped quickly and was not damaged in the shipping. The only downside is that it had a slight discoloration on the front drawer. Craft a sleek look in a bedroom with the cool hues in this rustic dark grey oak nightstand. Constructed for ultimate sturdiness, English dovetails and Kenlin center drawer glides maintain the structure, dressed up by two long and sleek drawer pulls. Dimensions 23.5 In. X 16.0 In. X 24.25 In. I bought 2 of these nightstands and let me just start off with, these were the best packaged furniture pieces I've ever received from an online company! These things were super secure and safe from even the most careless carrier. They come mostly assembled, you just have to attach the feet and the drawer pulls. This took maybe 10 minutes total- super fast and easy to do! The top drawer is lined in felt, which is a nice touch. Overall, I love these nightstands and recommend them full-heartedly! They look just like picture. Quality though is horrible. The top of one night stand were chipped in 2 spots. And one came damaged. Drawers also don't pull out all the way making it hard to see back of drawer. 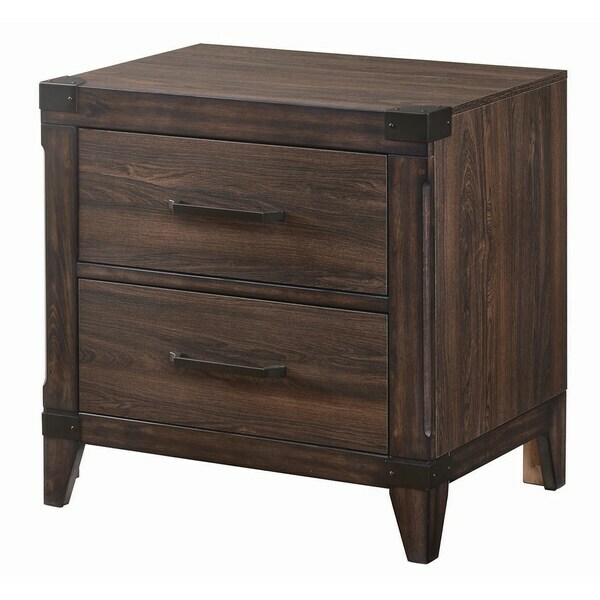 I purchased this as an additional nightstand to the 5 piece set I ordered. This piece shipped separately and very quickly. (ordered Tuesday and received Friday) I can’t wait for the rest of the set to be delivered! The rustic oak color is very nice and no splinters. However, it was much shorter than I had anticipated and would have liked for it to be a little taller. Delivery was quick. Wood looks nice and there wasn't any damaged that occurred during the delivery. Installing the legs were easy. Each one was labeled and so was the corner that you installed it on. I just wish the drawers used actual rails instead of the little guide at the bottom. Other than that, It was a solid purchase.